This post is part two in my "Perfect St Andrews Golf Trip" series. 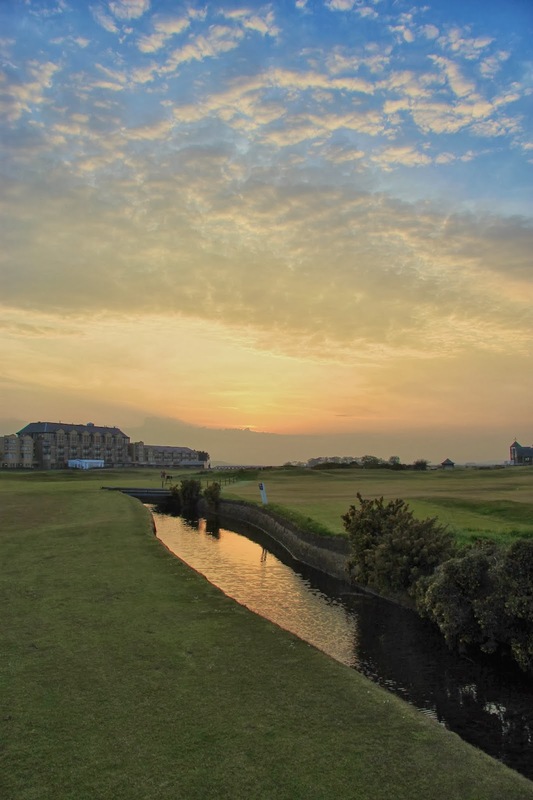 The first post, titled "Perfect St Andrews Golf Trip - Where to Play Golf", can be found here. There are many great accommodation options in St Andrews. The town is filled with hotels and B&Bs, ranging from very expensive options all the way down to St Andrews Tourist Hostel. Because of the wide array of choices, it would be impossible for me to review all the hotels and B&Bs. I have included places in this post which I have personally experienced or about which I have heard positive reviews from friends and family. There are undoubtedly many other good options, and please leave a comment if you have experienced one of the others. The Old Course Hotel is the most recognizable hotel in St Andrews. The five star accommodation borders the 17th hole and offers the best in luxury. The Kohler Water Spa is highly ranked year after year, and, although I don't know from experience, it must be a good way to end a day of golf. With Kohler owning the hotel, you can imagine a very high PowerShower Rating in the rooms. Be aware that the Old Course Hotel has no ability to book tee times on the Old Course, despite its name. However, the hotel is linked with the Dukes Golf Course, and a shuttle brings guests the fifteen minutes from hotel to course. A handful of nights in the Old Course Hotel will result large bill, but if you are able to handle the cost, the luxury is unmatched. The hotel is a ten minute walk from the center of St Andrews and a five minute walk from the first tee of the Old Course. The Jigger Inn pub is an historic St Andrews pub attached to the Old Course Hotel sitting on the 17th hole of the Old Course. It is definitely worth visiting for a pint. If you have visited St Andrews before, you have probably noticed the large building on the horizon line while looking south from the town. The Fairmont is a large hotel that is a short 10 minute drive outside of St Andrews. The hotel offers many of the luxuries that can be found at the Old Course Hotel and the two hotels compete for clientele. A shuttle takes guests back and forth, as often as necessary, from the town to the hotel. The Fairmont also has two golf courses on its grounds. The Kittocks Course was originally designed by Gene Sarazen and has great coastline views. The Torrance Course was designed by Sam Torrance and is set further inland. The views from the hotel make it a great place to have a pint or coffee. If you have a large group coming to town, the Fairmont should be one of the first places to check. Many visitors to St Andrews have had post round drinks in the Dunvegan, but many don't realize that the pub is a hotel. Owners Jack and Sheena have rooms above the bar, as well as a suite above Auchterlonie's golf shop across the street. A full breakfast is included in the rates at the Dunvegan, and the owners and staff give the place a very friendly atmosphere. It is crucial to book rooms at the Dunvegan well in advance. Many people come back year after year, and repeat guests fill up the rooms the entire summer. The Russell Hotel is located an extremely short two minutes from the first tee of the Old Course. Golfers can literally stumble out of bed onto the first tee. I have had family stay in the Russell Hotel; they have had nothing but positive experiences. A small bar and restaurant on the ground floor of the hotel have a true local feel. The Russell is not a high luxury hotel, but it offers everything you could need while leaving extra money in your wallet for an additional round of golf. The Rusacks is one of the best located hotels on this list. It is a very nice four star hotel right on the 18th hole of the Old Course. Rooms looking straight down onto the Old Course are available for a premium. The "R" Bar and three AA rossete Rocca Grill are both on the ground floor of the hotel and offer great food and drink in addition to some incredible views. More casual dining can be found in the One Under Pub, located just below the hotel. Note: St Andrews Golf Hotel, which is located two minutes from the Old Course, is currently under refurbishment and will re-open as Hotel Du Vin St Andrews. The Hotel Du Vin line has a great reputation and will undoubtedly be another great option in town. It is due to open mid-2014. I have had less experience with the B&B options in St Andrews, but, in researching this post, have spoken to people who recommend a number of options. Two specific streets in St Andrews, Murray Park and Murray Place, are a three minute walk from the Old Course and are home to fifteen St Andrews B&Bs. I have heard great things about many of the places in this area. All offer great "Full Scottish" breakfasts with haggis and all the accompaniments. Burness House is one of many B&Bs on Murray Park. The owners of Burness House set themselves apart by offering a limited number of guaranteed tee times on the St Andrews Old Course. Packages that include a round of golf on the Old Course, in addition to a tee time on the New or Jubilee, are available for four golfers. I would assume you need to book this well in advance. Six Murray Park is another family run option in St Andrews about which I have heard nothing but positive reviews. The B&B is known for being particularly friendly and they offer a very good winter golf package deal. The location of Castlemount makes it a particularly appealing place to stay. The bed and breakfast is at the top of The Scores, the most picturesque street in St Andrews. Castlemount is located directly across from the St Andrews castle ruins. A short eight minute walk will have you on the Old Course, and five minutes will have you in the town center. The warmth this bed and breakfast exudes on cold days always makes me want to pop in for a coffee. Note: Hazelbank Hotel (http://www.hazelbank.com) was mentioned to me by multiple people as a good option for accommodation in St Andrews. 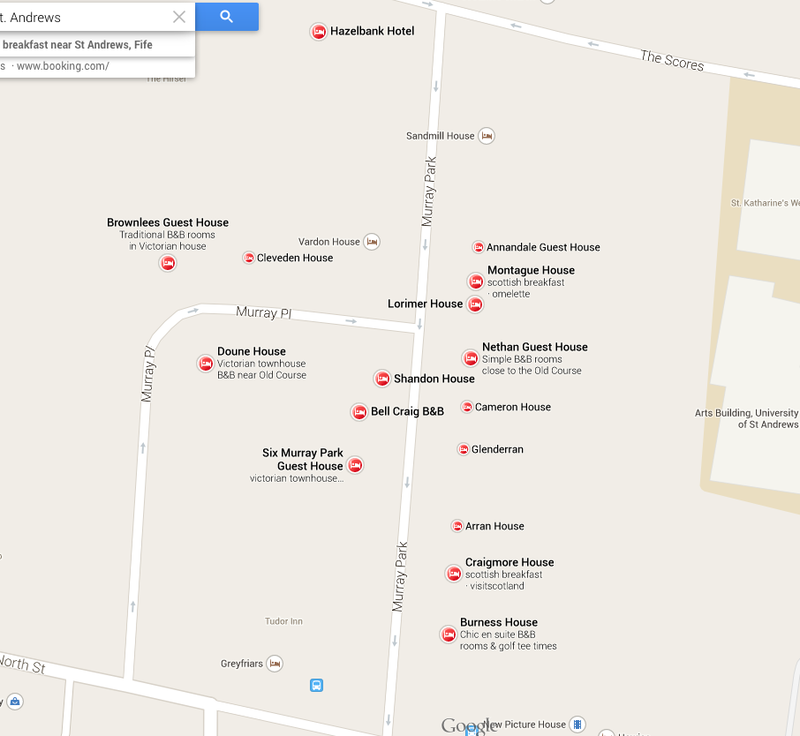 As mentioned earlier, there are many other B&B or guesthouse options in St Andrews. They will typically offer a much more personal experience than the larger hotels, and their breakfasts are hard to beat. Another option is to stay in University of St Andrews housing during the summer when students are away. This is particularly inexpensive, but, understandably provides just the bare minimums. The best accommodation in St Andrews depends entirely upon your needs. We are fortunate to have many offerings in town and nearly all bases and price points are covered. If you need any advice and want to offer up opinions of your own, leave a comment below.